Not long after I started working for Wisden Cricket Monthly, I asked the editor, David Frith, why Wisden's style for Trinidad's capital Port-of-Spain included the hyphens, as I'd usually seen it without. "Jeff Stollmeyer told me it had them," he laughed, "and since he owned half of it, I thought he should know." 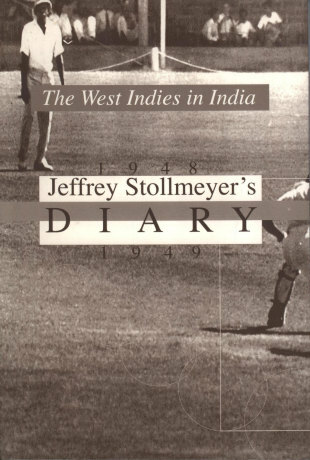 This tale was brought to mind recently when I managed to get hold of a difficult-to-find book, Stollmeyer's diary of the 1948-49 West Indian tour of India, their first to that part of the world. It was published posthumously (by Royards of Trinidad in 2004), since Stollmeyer himself died in 1989, shortly after being shot by intruders at his home. The diary was not intended for publication, but he assiduously mailed chunks of it home during the trip to his new wife, and it is a fascinating social and cricketing document. One of six sons (brother Victor also played Test cricket) of a wealthy Trinidad cocoa planter who rebuilt the family fortunes after losing heavily in the Wall Street crash, Stollmeyer was an opener who toured England in 1939 as a teenager - he made 59 in both the Lord's and Oval Tests, aged 18 - and played on for a decade after the war. He finished with over 2000 runs from 32 Tests. He was, by all accounts, an elegant and stylish batsman. "At his best he was a beautiful player," wrote EW Swanton, "as he showed especially with the 43 and 78 he made on a terrible wicket against England at Old Trafford in 1950." Other reports talk of his front-foot play, and in my mind's eye he must have batted rather like Mike Denness - pretty to watch, a fine, upright driver, with a suggestion of fragility against extreme pace (Stollmeyer struggled at first against Ray Lindwall in Australia in 1951-52, although he was hardly alone in that). His diary of the 1948-49 Indian tour is fascinating - from time to time you're reminded that this was an awfully long time ago, with accounts of cross-country trips taking three days by train, and visits to the cinema, rather than laptops and DVDs in the team room. But more often it reads like the story of a more recent tour, with the usual grumbles about the organisation, the heat, the travelling, and the captaincy. "If ever a tour was mismanaged, this one was," he snaps at one point, while another observation will strike a chord with anyone who had to tour the subcontinent before air-conditioned hotels became the norm. The Indore Guest House seems unlikely to have earned many stars in the Trinidad travel guide: "The conveniences are nil. There are no mirrors, no flush lavatories, and only one shower to accommodate the team! I couldn't swallow the food as it had the distinct flavour of cockroach." The skipper was the white Barbadian allrounder John Goddard, with Stollmeyer as his deputy. There are frequent digs about Goddard's captaincy style, particularly his tendency to let the game drift: at one point our indisposed diarist hurries down to the boundary from the cool of the dressing room to suggest some tactical changes, and elsewhere he implores Goddard to instruct the batsmen to get a move on. Stollmeyer's own ambitions in this area are not exactly hidden: at one point he selects his side for the 1950 England tour - still almost 18 months away - with himself as captain. He notes the need for a left-arm spinner, and worries about the impact the Trinidadian legspinner Wilf Ferguson will make. The team ended up largely as he surmised, but the jigsaw was completed by the unexpected arrival of Alf Valentine - the slow left-armer he craved - and the right-arm mystery spin of Sonny Ramadhin. But Goddard was the skipper on that famous tour... and a few years later, Stollmeyer immediately retired (in his mid-thirties) when he learned that Goddard had been recalled to captain again in England in 1957. Many would say that George Headley should have been in charge all along: he had, after all, become West Indies' first black captain in the first Test against England at home in 1947-48. But Headley missed the rest of that series with injury, while Goddard oversaw series-winning victories in the third and fourth Tests, so it was not entirely surprising that he took charge in India as well. Selected for the tour at 38, Headley hardly played, picking up various injuries that proved remarkably unwilling to heal. Stollmeyer, while frequently remarking with admiration about his team-mate's tactical nous, is fed up by the end, referring to "tourist Headley" and observing, after he pulled out of the fourth Test, that "George has definitely funked this game". To get to India the team travelled by banana boat to England, then by air. The sea voyage - enlivened by stowaways and frequent games of cards - seems to have been a useful unifying experience, although modern-day players would gasp at the idea of spending six months on one tour, large chunks of it on board ship. By and large the team seems to have been colour-blind: although Stollmeyer spent a lot of time with Gerry Gomez, a long-standing white friend from Trinidad, he's also often to be found in the company of Jimmy Cameron and John Trim, who were black. Early on Stollmeyer was concerned that Everton Weekes and Clyde Walcott, still young but soon to be hailed as two-thirds of the Three Ws (Frank Worrell was unavailable for this series), were "raw Bajans". But both had fine tours - Weekes reeled off four successive Test centuries before being sawn off for 90 in his next innings - and by the end the admiring Stollmeyer is happy to admit: "All my fears with him were absolutely unfounded." In a battle of two strong batting sides West Indies won the fourth Test by an innings, and the other four were drawn, which perhaps makes the series sound less interesting than it was. Stollmeyer played a big part in it, despite missing one match with a nasty bout of chickenpox that laid several of the team low. Ironically, though, victory meant Goddard was inked in as skipper for that 1950 tour of England: Stollmeyer's captaincy ambitions were put on hold until India paid a return visit to the Caribbean early in 1953 (he did deputise in one match in Australia in 1951-52, and scored a memorable 104 in Sydney, withstanding a barrage from Lindwall and Keith Miller). EW Swanton wrote: "Looking back, it seems even more evident now than it did at the time that Stollmeyer should have been the bridge between the white leadership of the early days and that which was available from the middle fifties in the shape of the exceptionally gifted Frank Worrell." And it's hard to disagree with the magisterial Jim. All in all, Stollmeyer's diary is an interesting and evocative read. I wonder if he kept such detailed accounts of his later trips, particularly in England in 1950?